Downtown Berkeley got a taste of populist luxury last month with the opening of Phil’s Sliders, Hugh Groman’s storefront café devoted to the mini burger. And while there’s no denying that the Marin Sun Farms beef patties and Valrhona chocolate in the shakes sets Phil’s apart from Nation’s basic, there’s something else on the short, sweet menu here that'll make you put your slider down: tater tots. The humble tot has become an object of camp nostalgia for Gen Y bar crawlers (at San Francisco’s Bullitt bar, the hammered can try to sober up with something called Totchos, tater tots cheesed up like nachos). But Phil’s treats America’s version of the potato croquette with nothing but respect. Tater tots, minus the camp. Phil’s chef David Going feeds organic russets into a special peeling machine, then boils the potatoes to an internal temperature of 160 degrees. An industrial-grade food processor grates the cooked spuds into shreds, which are packed into sheet pans and baked till they dry out a bit. 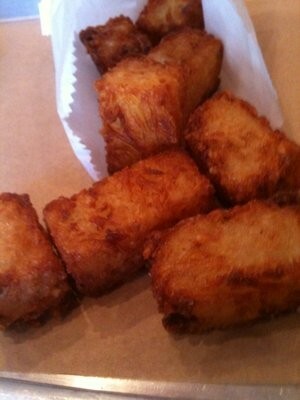 The mass is cut into rectangular tots, then deep-fried to order in canola oil. What emerges are tots with the perfect mix of tender, chewy, and crisp-skinned, with stray wisps of grated potato as satisfying as the edges of hash browns. As for ketchup, go ahead and dunk if you feel the need, but believe it: The last thing these tots need is a companion.